Continuing with my recent coverage from the University of Texas campus, here’s a photo of Chipotle, a restaurant that’s a notch or two above the typical fast food fare. I shot this from across the street on Guadalupe Street, better known on campus as “The Drag”. I like Chipotle and I eat at one at least once or twice a week for lunch. My burrito bowl mix is comparably healthy, with low carbs and lots of fresh vegetables and for a reasonable price. 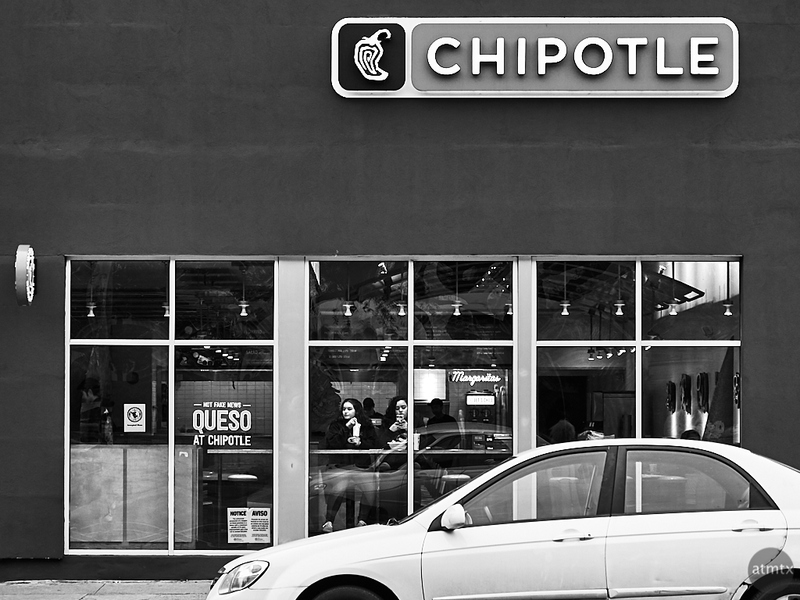 Chipotle is still trying to recover from their food problems from a few years ago. They’ve recently introduced two new menu items, which you can see on this photo — Queso and Frozen Margaritas. My family, friends and co-workers in Austin have eaten the Chipotle queso and we universally agree, it’s terrible. Someone described it as made from vegan cheese. It’s not creamy and feels a little thin, lacking dimension. I read in an article that their queso was market tested in Colorado and Northern California. Figures. They should have tested in Texas. We know good queso here. Their big challenge is trying to make it healthy without weird chemicals. That might be an oxymoron and nearly an impossible task. Queso is not exactly healthy food. I almost never crop my photos in post and what you see on this blog is typically framed in-camera. The exception is when I use the distortion correction on Capture One, which has an unintended effect of cropping in. But usually, it’s not by much. Today’s photo is a big exception. I actually cropped more than usual and, in the process, changed the aspect ratio to 3×4. One of the big differences shooting with the Canon G7X Mark II is its default 2×3 ratio, which matches traditional 35mm film and DSLRs. I actually prefer the 3×4 ratio to which micro 4/3 format defaults. I think it’s a better ratio for portraits and I even like it for landscapes, most of the time. I know this is a preference thing. My friend Mike, for example, likes 2×3. I can set the Canon to display in 3×4 format, but I’ve kept it at 2×3 for now to maintain maximum resolution. Luckily the 20MP G7X Mark II gives an adequate resolution for cropping. Even with this extensive crop, I created a more than adequate 14MP image. When I think queso or margaritas, I certainly don’t think Chipotle. 🙂 I actually haven’t been in one in many years. Being from San Antonio, Chipotle isn’t an appealing choice for Mexican food. Might be a healthier choice though. Yeah, I don’t really consider it Mexican either. It’s healthy, fast and highly customizable.